restaurant in Palestinian territory occupied by Israel. power's civilian population into occupied territory. 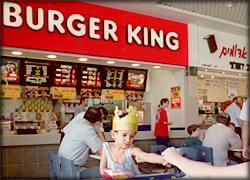 Burger King reports 10,365 restaurants worldwide (as of April 30, 1999). strengthen the organization in international markets. American Congress and Partners for Peace. A group of American Muslims is calling for a world-wide boycott of the fast-food chain Burger King after the company opened a new restaurant in an Israeli settlement on the West Bank. American Muslims for Jerusalem (AMJ) is demanding the closure of the store at Ma'ale Adumim - disputed land which was occupied by the Israelis during the 1967 war. The organisation says the settlement, five miles east of Jerusalem is illegal under international law. Khalid Turaani, the AMJ's executive director, said: "This settlement is part of a series of Israeli projects that ring the city. This ring is generally viewed as an attempt by Israel to consolidate control over territory it seized in 1967. "Our community views Burger King's decision to become a party to illegal occupation with profound distaste." Burger King says that it is only one of a number of global brands with a commercial presence in the West Bank. In a statement, the company said it is "sensitive to all nationalities, religions and cultures, and it is our policy to be respectful of the needs of each in providing access to our products". Spokeswoman Kim Miller said company officials were trying to "encourage a dialogue" with those involved. "Those conversations have to take place. We need to gain a better understanding of their issues," she said. The AMJ says that to avoid a boycott Burger King will have to close down the restaurant and release a statement promising not to open any other restaurants in occupied land. The group, which is based in Washington DC, also wants Burger King to make a donation to help Muslim refugees. The West Bank, east of Jerusalem, is land disputed between Israel and the Palestinians. The two sides are discussing the resumption of negotiations aimed at achieving a permanent peace agreement and a final disposition of West Bank territory, some of which has already has been put under Palestinian administration. Nine groups, including the Arab American Institute and the Palestinian American Congress, joined AMJ in protesting against the new Burger King restaurant. Burger King has more than 10,000 fast-food outlets world-wide, including sites in Muslim majority nations of Malaysia, Kuwait, Oman, Qatar, Saudi Arabia and UAE. The Arab League is to consider backing a campaign to force the closure of a fast-food outlet in a West Bank Jewish settlement built on land seized during the 1967 war. The American-based company Burger King has franchised a fast food outlet in Maale Adumim - a settlement of 25,000 residents just east of Jerusalem and one of the fastest growing in the West Bank. American Muslims reacted by calling for a worldwide boycott of Burger King outlets unless the franchise is withdrawn. The Arab League now says it plans to discuss the matter at a meeting of foreign ministers next month. Burger King officials have said the Miami-based company is taking the issue very seriously and will try to resolve it. They have said they meant no offence by opening the new restaurant in a controversial location and plan to meet the executive director of American Muslims for Jerusalem (AMJ) to discuss the issue. However critics have said that other US companies - including McDonalds - have refused to open in areas outside of Israel's 1967 borders. Khalid Turaani, the AMJ's executive director, said: "Our community views Burger King's decision to become a party to illegal occupation with profound distaste." In Maale Adumin itself, the burger restaurant is reported to be busy with customers critical of the boycott threat. "We shouldn't involve political opinion with food or other such things. I'm very fond of Burger King," said one settler, Orna Makov. Maale Adumim Mayor Benny Kashriel says the boycott could hamper existing peaceful relations between Israelis and Palestinians. "We are doing our shopping in the nearby Palestinian market, and they are coming here to our market. Any (attempt) to disturb these relations between us and the Palestinians will hurt the peace negotiations," he said. So far, nine groups, including the Arab American Institute and the Palestinian American Congress, have joined AMJ in protesting against the new Burger King restaurant. Facing a worldwide burger boycott by Arab and Muslim groups, fast food giant Burger King has announced it is closing down a controversial franchise outlet in the Israeli occupied West Bank. The Miami-based chain, owned by UK firm Diageo DGEL, said it had ordered the Israeli franchisee to remove the Burger King logo from the restaurant immediately. The dispute focused on a branch of Burger King in the fast growing settlement of Ma'ale Adumim - built on disputed land occupied by the Israelis during the 1967 war. The Palestinians have long argued that such settlements are illegal. The opening of the restaurant sparked outrage from American-Arab and American-Muslim groups who said it amounted to support for the Israeli occupation. Burger King said the Israeli company, Rikamor Ltd, had falsely stated that the restaurant would be located in Israel and as such was in breach of contract. The corporation, the world's second largest food chain after McDonalds, said it would not approve the opening of restaurants in the West Bank at such a sensitive time in the peace process. "Burger King regrets that its name and reputation have become entangled in matters that have nothing to do with providing quality food and service to its customers," said David Williams, Burger King regional president. The company added that is has "no interest in taking sides in the Arab-Israeli peace process, except to welcome its early and mutually acceptable outcome." Earlier this month, the case attracted the attention of the Arab League which said it would discuss the case at a meeting for foreign ministers in September after a request from Yasser Arafat's Palestinian Authority. The growing row had led to calls for a boycott of Burger King, which has 130 restaurants in the Middle East and aims to move soon into Lebanon and Jordan. Shortly after the Burger King announcement Khalid Turaaniof of the American Moslems for Jerusalem congratulated the corporation for "doing the right thing." "Corporations should not do business and investment on land that is occupied by force and whose original owners have been displaced into refugee camps," he said. However, a leading Jewish civil rights group, the Anti-Defamation League, denounced Burger King's decision as "a blatant capitulation _ to the outrageous guerrilla tactics employed by American Arab and American Muslim groups." Alhamdulillah, In an apparent response to a worldwide Muslim and Arab boycott, Burger King Corporation today announced that it has cancelled the contract of a franchise in the occupied West Bank. On August 5, a coalition of Muslim and Arab organizations* led by American Muslims for Jerusalem (AMJ), announced an international campaign to boycott Burger King restaurants. The coalition called for the boycott after Burger King ignored Muslim concerns over the opening of a restaurant in a settlement on Palestinian territory occupied by Israel. At a news conference today in the Washington, D.C., coalition representatives called for a lifting of the boycott. "Burger King Corporation today announced that it has cancelled the right of Rikamor, Ltd., its independent franchisee in Israel, to operate a Burger King food court counter in Ma'ale Adumim in the West Bank. Burger King has asked its franchisee to remove the Burger King brand from the site immediately." The fast-food giant said it made the decision because of breach of contract and "misrepresentation" by the Israeli franchisee. The statement claimed that the franchisee "falsely informed Burger King that the food court would be located in Israel." "We are pleased to see that Burger King decided to respect international law and the sensitivities of Muslims worldwide. This courageous step should set a precedent for all corporations considering a move into territories that have been occupied by force. We would also like to thank all those in the Muslim world who supported this successful campaign." *COALITION MEMBERS: American Muslim Alliance, American Muslim Council, American Muslim Foundation, American Muslims for Jerusalem, American Task Force for Palestine, Arab American Institute, The Council on American-Islamic Relations, Muslim Public Affairs Council, National Association of Arab Americans, Palestinian American Congress and Partners for Peace. A quiet, unassuming Burger King restaurant may seem like an unlikely location for the latest chapter in the long-running dispute between Arabs and Israelis on the West Bank. But on Thursday, Burger King said it had canceled the rights of the independent franchisee to operate it, following pressure from American Muslims. The restaurant opened four months ago in a new shopping mall in Maaleh Adumim, a Jewish settlement of 25,000 residents three miles east of Jerusalem that is located on land Israel captured in the 1967 war. Palestinians consider Jewish settlements the main obstacle to establishing their state in the West Bank and Gaza Strip. And American Arab and Muslim groups had threatened to boycott the fast food chain. But it seems Burger King can do no right. Today, the settlements mayor expressed anger at Burger Kings decision. Denouncing the move as a shame and an abomination, Benny Kashriel blamed Palestinians for initiating the boycott threat and called on Jews around the world to boycott Burger King. Kashriel, who also serves as chairman of the Yesha Council, the body representing Israeli settlers in the West Bank, called on Israeli Prime Minister Ehud Barak to suspend peace talks with the Palestinians. Hamburgers and politics should not be linked, Kashriel said, condemning the decision to shut down the restaurant. To make matters more confusing, the shopping malls director denies the restaurant is to close. The date of the closure is still to be decided.